For the die-hard John Lennon/Beatles fan on your holiday shopping list, we have two (or more) versions of Lennon’s most commerical solo album, Imagine. This qualifies for BIG TICKET DAY due to the sheer amount of goodies included. 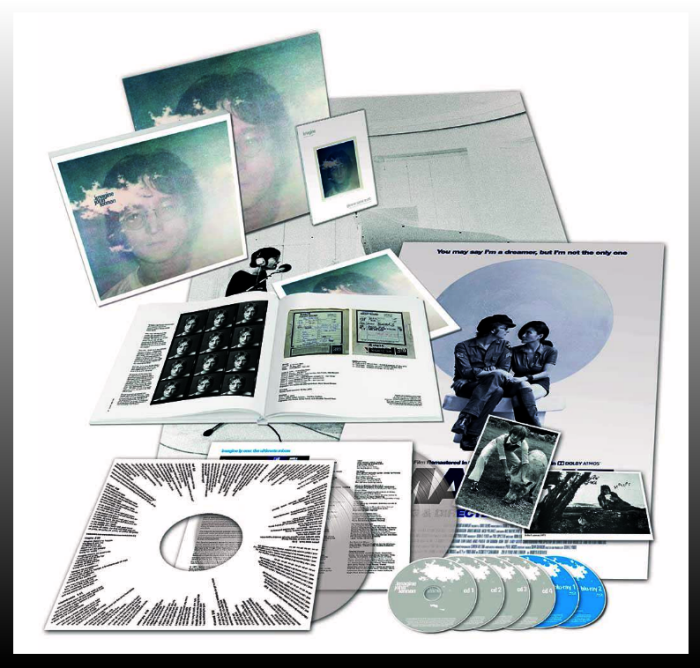 The Ultimate Collection features brand new 5.1 Surround Sound and Stereo mixes of the Imagine album, Singles, Extras and Out-takes from 1971, Raw Studio Mixes live in Surround Sound from the centre of Ascot Sound Studios, minimalist Elements Mixes, the Evolution Documentary that explores the growth of each song from demo to final mix, and interviews with John & Yoko by old friend Elliot Mintz – to create the Ultimate Deep Listening Experience for the Imagine album. Released separately is the video release, John Lennon & Yoko Ono: Imagine / Gimme Some Truth, which collect both films fully restored and remastered. This collection of two films by John and Yoko, Imagine and Gimme Some Truth (on DVD and blu-Ray) . Both physical formats include exclusive, never-before-seen extras and have been hand restored, frame-by-frame, from the original film reels and remastered for HD and Blu-ray. The DVD or Blu-ray alone aren’t big-ticket items, but if you have a really devout Lennonista on your gift list, you can spring for the Complete Fan Bundle, which includes not only The Ultimate Collection AND either the DVD or Blu-ray of the films, AND, the vinyl release of Imagine, remastered, with a full disc of extras, pressed on clear vinyl. Imagine The Ultimate Collection retails for $74.99 and can be found anywhere that sells music (and boxed sets). The Complete Fan Bundle includes The Ultimate Collection and the 2 LP clear vinyl plus the video, and can be ordered from Discover Music, where you can choose either the DVD or Blu-ray for $130.